Scent glands, flank glands or hip spots … whatever you call them, these little glands seem to confound hamster enthusiasts and even many veterinarians. 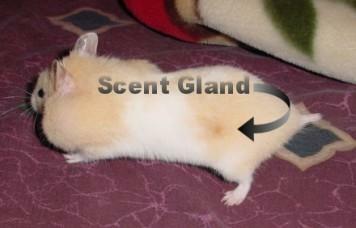 Hamster scent glands differ depending on the gender of the animal and also the species. The scent glands of Syrian hamsters (also called golden hamsters and teddy bear hamsters) are bilateral (there are two of them) and located on the hips. They are flat and can appear wet or greasy looking. Some have pigmentation. Some have long hairs growing over them. 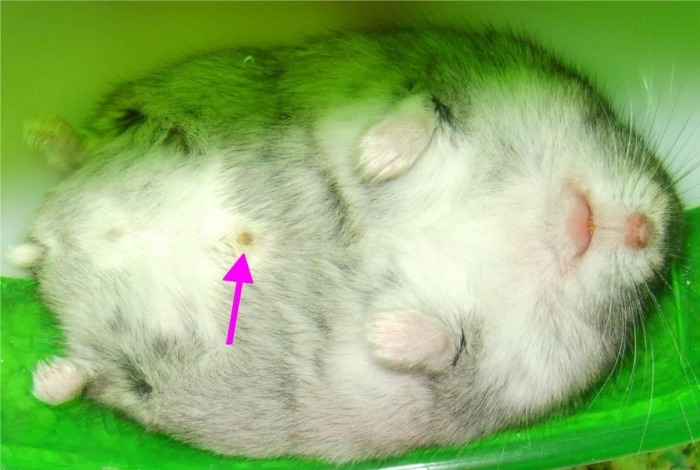 On all domestic dwarf hamsters – Campbells, Chinese, Roborovskis, winter whites – there is a single scent gland located on their undersides, a bit below midline. These glands stick out, are sometimes hairless, and often look covered in a greasy secretion. "The scent glands are more prominent in males than females. When the male is excited, it will lick its scent glands until the entire area is wet. It will also scratch and rub itself as if the area is irritated." For some reason, Mother Nature saw fit to equip hamsters with scent glands in addition to the usual marking and mating equipment. Hamsters mark their territory by rubbing their glands against objects. They also use the glands to emit an odor that signals when they are ready for mating. Scent glands are perfectly natural, normal hamster body parts, yet they are often a source of confusion and concern to human hamster owners and even some vets. Many novice hamster owners don’t realize their pet has scent glands and are surprised and often concerned when they first notice them. At maturity, these glands become obvious by sight and often by smell. The smell can be powerful and off-putting to humans. The strength of the odor varies by hamster, and it can be transferred to human hands in many cases. To the untrained eye scent glands can look like cancerous growths. Plenty of new hamster owners show up at the vet’s office to point out the ‘tumor’ they just found on their pet’s tummy or hip. And if the gland appears to be oozing or is pigmented, it can look even more like a troubling growth. Unfortunately, hamsters’ scent glands do occasionally get infected. They also develop tumors, which are almost always malignant. Both these conditions are especially true for dwarf hammies. And older hamsters can develop scent gland-related hemangiosarcoma and melanoma, two forms of cancer. So concern about your pet’s scent glands isn’t entirely unwarranted. Since each pet is unique, you should learn what ‘normal’ is for your hamster – what his scent glands look and smell like normally. Then you can keep a careful eye out for any changes in appearance and odor, and also in your hamster’s behavior. If you notice any of those symptoms, you should make an appointment with your veterinarian. If you have multiple male hamsters housed together, you should know that males are known to bite each other’s scent glands -- and even cannibalize them -- when they share close quarters. So keep an eye out for fights among your male pets, or to be safe, provide each male with his own habitat.